A debate over the real value of investment in fossil fuels has raged all summer. 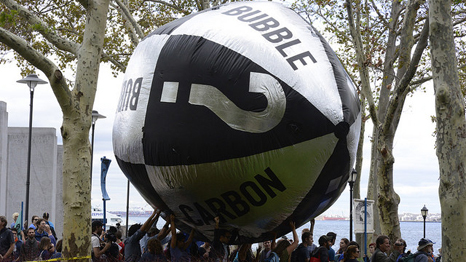 September’s climate summit in New York brought it into sharp focus. There, Anthony Hobley of the Carbon Tracker Initiative told the assembled global leaders that tackling climate change put a trillion dollars worth of fossil fuel investments at risk. This debate has provoked the oil majors into an unprecedented public defence of their assets’ value led by Exxon and Shell. Stripped of its detail, their argument turns on whether or not you believe governments will meet their obligation under the climate treaty to keep the rise in global temperatures below 2°C. If they do, there will indeed be a lot of stranded assets. If they do not then further investment in fossil fuels is safe. The consensus within the fossil industries is that governments will not only fail, they will not even try very hard. Hence their conviction that none of their assets will be stranded. Who is right is anybody’s guess. Even the governments don’t know yet. Geopolitics and capex constraints could combine to drive oil prices dramatically up. Disruptive technologies could collapse the price of low carbon alternatives further. Either would prompt a recalculation of the political risks of climate change policy. The fossil industries’ confidence is based on their modelling of the energy future. This foresees global energy demand growing about 50% by 2050 with fossil fuels meeting over 60% of that demand. The companies draw reassurance from the broad endorsement of their view by the International Energy Agency. This soothing analysis overlooks two problems. The first is methodological. None of the models used by the companies or the IEA incorporate any impact from a changing climate on their growth assumptions. Growth goes up, demand goes up, production goes up and the temperature goes up. All is well. Except that the current rise in temperature of less than 1°C is already dislocating economies. Further rises will dislocate them more as both the World Bank and two former US Treasury Secretaries have recently warned. The growth to fuel the energy demand the fossil companies expect is driven by rising incomes in the aspiring urban populations of the emerging economies. But those are precisely the incomes that will be hardest hit by climate driven spikes in food and water prices and the costs of extreme weather events. The growth will disappear as the temperature rises. The second is political. Governments are fickle. They blow with the wind. The fossil industries are not just on a collision course with governments committed to a 2°C world they are also on a collision course with all the businesses whose value will be damaged as the planet warms. So far the latter have been silent in the climate debate. But that is beginning to change. Some industries are already feeling the pinch – wine and winter sports for instance. A significant proportion of the small businesses affected by floods never recover. As temperature rise they will be joined by other, larger industries – property, tourism, forestry, agriculture. Growth for the big consumer brands, Unilever or Nestle, depends on precisely the rising urban incomes that will be hit soonest. The value of the businesses for which a changing climate is a threat far exceeds the value of the fossil fuel industries. The business voice in the climate debate is currently asymmetric, dominated by the fossil fuel industries and their allies – the climate makers. It will become more balanced as the climate takers – the rest of the business community – finds a voice. This will alter the political risk equation for governments. They constantly juggle competing urgencies. What is pressing today can be ignored tomorrow. The analytic and political foundations on which the fossil industries confidence is based may not be as robust as they think. These industries face a paradox. They make high risk investments in large projects. Typically there is more than a decade between initial investment and first revenues. Then they must earn a return. This puts a premium on economic and political stability. But that is precisely what will be undermined as those investments create a world 2°C or more warmer. In reality the transition to a low carbon economy is already well underway. The capital markets are looking ever more favourably on low carbon investments and are increasingly disappointed by the fossil industries’ returns on their $600 billion/year capex. What matters now is whether this is an orderly or disorderly transition. If it is driven by events and climate policy failure it will be disorderly. The fossil industries will destroy value for their own and other businesses. For it to be an orderly transition governments will have to act with more ambition and consistency than hitherto. Above all, they will need to enshrine their commitment to building a carbon neutral global energy system by 2050 into next year’s big climate meeting in Paris.